In 1854 The Dalles was designated by the Territorial Legislature as the county seat of the largest county ever formed in the United States. Wasco County extended from the crest of the Cascade Mountains to the Great Divide in The Rockies and encompassed 130,000 square miles. The Dalles was the only community within that area that was on the maps at that time. Oregon became a state on February 14, 1859. The east boundary of Wasco County became the current state line ─ still a large county. Over the years 17 counties were formed from the 1859 tract. When construction was finished, the officials inspected the building and promptly refused to accept it until the contractor had “put on the hardware.” Evidently the doors were there, but did not lock! The building was located at 3rd and Court Streets facing east. It was flush with the wooden walk and the only access to the upstairs courtroom was to exit the downstairs, climb the steps, and enter the upper door, then on the north side of the building. What is now the porch represents the sidewalk, but after a short time a cover was built over the sidewalk so that getting prisoners upstairs could be done without complete exposure to the elements. The building was used as a courthouse until 1883 when a second, larger courthouse was constructed at the corner of 3rd and Union Streets. 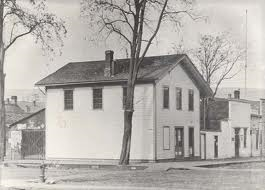 The Original Courthouse became the City Hall for The Dalles. 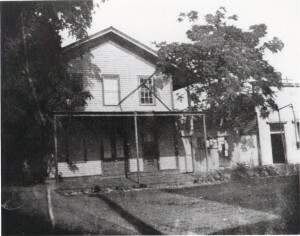 In 1909 the building was deemed too small for the city’s needs. It was moved across 3rd Street to the current site of Columbia River Banking Co. where it became a rooming house. Brady’s Grocery Store across the street needed parking in 1961, which put the little building in jeopardy once again. A group of citizens insisted that the building be saved and moved it to city property near the Lewis and Clark monument on West 2nd Street. There it languished until the city declared it a nuisance and proposed to destroy it. City Council voted to have the bulldozer there on a certain date. One of the leaders in the effort to save the courthouse was Alf Wernmark ─ a shoemaker who had come to The Dalles from Denmark as a child. He had a brother who became a state senator, but Alf made his mark on local history. He stood in front of the bulldozer and out-waited it. The group made a deal with the Council: a preservation committee would be formed. They would have a limited amount of time to find a new location and move the building, and another limited time to have the building fully restored and ready for public visits. They would fund the project themselves. If they defaulted, either on the time commitment or on the quality of the restoration, the city would reclaim the building and destroy it. Among the original incorporators were Wernmark, Lewis Nichols, Christine Keith, and Roman Bertrand. Other instrumental in the early work of saving and restoring the building were Jim Ellet, Ed McKane, Don Williams, Jean Krier, and many others. The Chamber of Commerce granted a 20 year lease for the lot to the west of the Chamber building. Soon $30,000 was raised. Al Staehli, a restoration architect from Portland, was engaged. Volunteers helped with construction and fundraising. 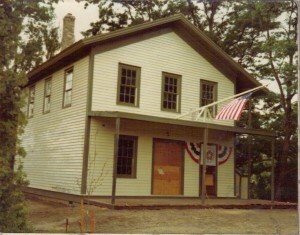 In 1976 the building was completed and dedicated and placed on the National Register of Historic Places. 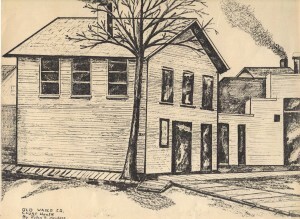 The following years saw others contribute to the building and the history programs it would house. Paul Kuiper was hired through a federal program and created a number of slide-tape presentations with the help of Fritz Cramer and Jim Weeks. History Forum programs began in 1980 and have become a mid-winter tradition. Tapes of the lectures have been saved, as have oral history tapes collected by Marilyn Ericksen and others. Bill Martin ran a bingo game at the Elks’ Club that helped pay off a construction loan and put the operation on a solid financial footing. Walt Ericksen took over the bingo from 1984 to 1992, moving it to Vogt Hall and raising an endowment that underwrites the continued operation of the courthouse. When the 20-year lease with the Chamber ran out, proposed terms for a new lease were too costly for the budget. At that time, the winter of 1996, Mill Creek flooded the old site, demolishing boardwalks and filled the crawl space with silt. A 50-year lease was negotiated with Wasco County for the present lot on West 2nd Place ─ a higher and dryer location! It cost $37,000 to complete the relocation ─ more than the original restoration. Eric Gleason and friends preserved and restored the old shed/root cellar/wash house that was on the back of the property. Because the preservation of the building has been such a well-supported community project, it has always been available without admission. A donation is requested in lieu of rent for private use of the facilities.